The walk out was very strange. First to see the tents being dismantled and barrels loaded onto yaks. Everywhere you looked, across the whole base camp, someone was lifting a duffel bag. I left by myself and found myself pausing to look back with bitter sweet thoughts. I stopped in Gorak Shep and said goodbye to the owner Pemba who always seemed pre-occupied with games for his phone while comping me hot chocolates. And in Lobouche, I shared a hot chocolate with Mingma – who I will just miss in Kathmandu. It was too early to drink beer. So I put rum in the hot chocolate. 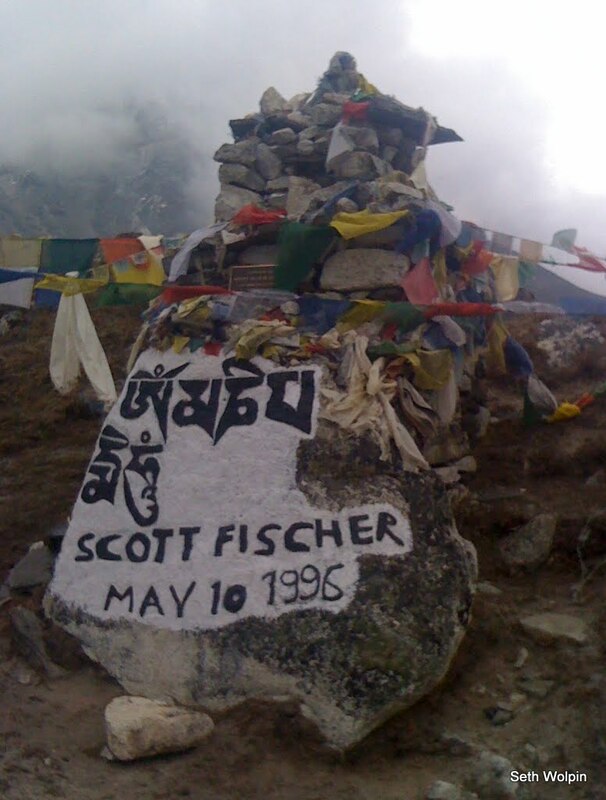 At the pass above Thukla, I noticed some one had painted Scott F’s chortan. I saw Trevor’s too but will hold off on writing about him – maybe indefinitely. 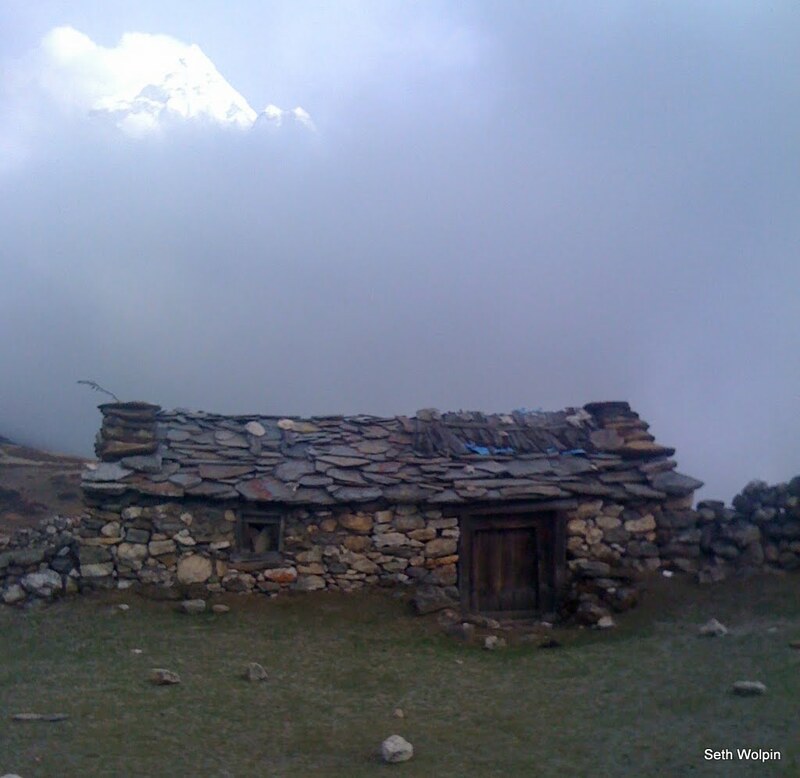 In Thukla, I took the owner up on his prior word for a free lunch if I summited. Nice people, good noodles and I walked off with a handful of pringles. 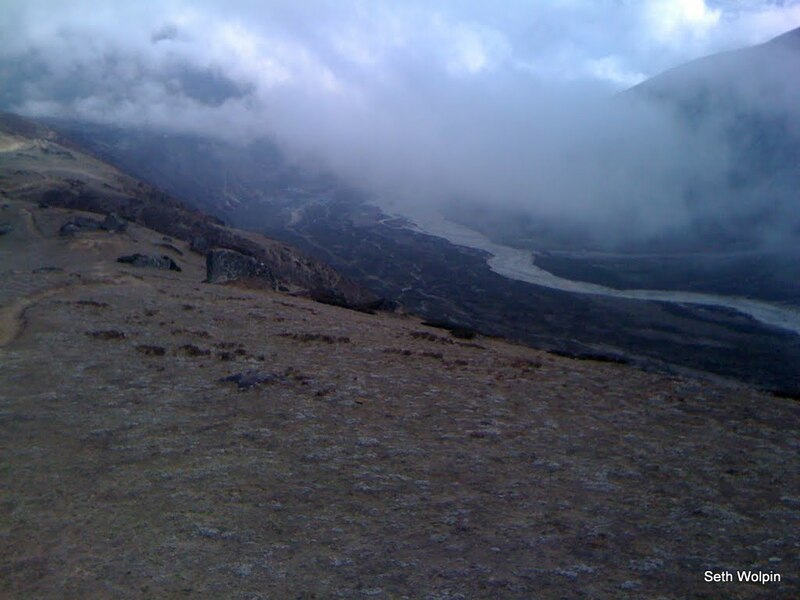 I took the high road to Pheriche and it was beautiful to look down at the valley. There is a small collection of seasonal tea houses with flag stone roofs that look like they will fall down any minute. Got into Pheriche close to dusk. The fancy White Yak was closed and we stayed at the ‘Shagrila’ which was no ‘Shagrila’. I abstained from the shower and decided to remain as dirty as hell. It’s more being freezing cold after the hot water than anything at all. The six hour walk took over 9. The next day I felt like an old man. I moved really slowly. But I started noticing green shrubs and small stunted trees. And then real trees and we walked through the Rhodendran forest near Deboche and it was blooming! Smells. Incredible! We heard children playing. I hobbled on and met campers Sarah from England and Jesus from Spain. Nice travelers. 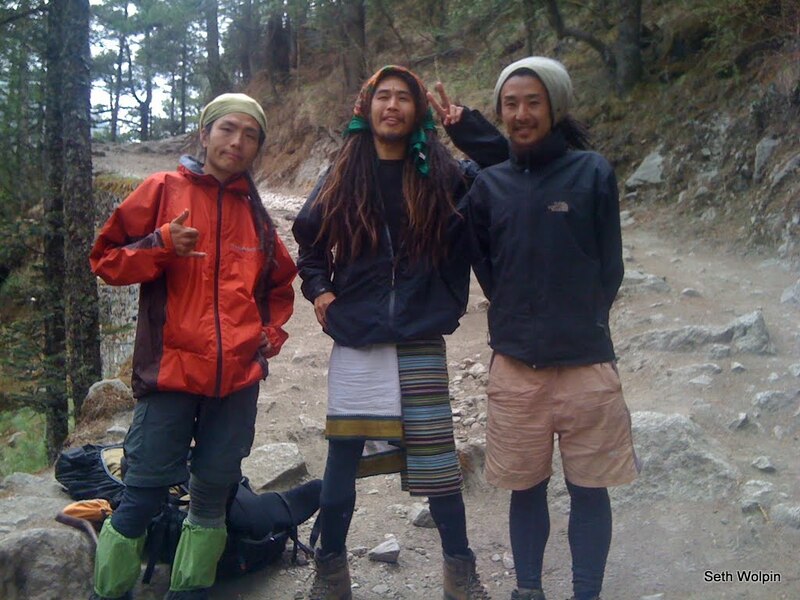 Partway up a big climb, I met three Japanese Rastas headed to base camp. They were very kind to me and the rest of my journey was much more peaceful. Arrigato! 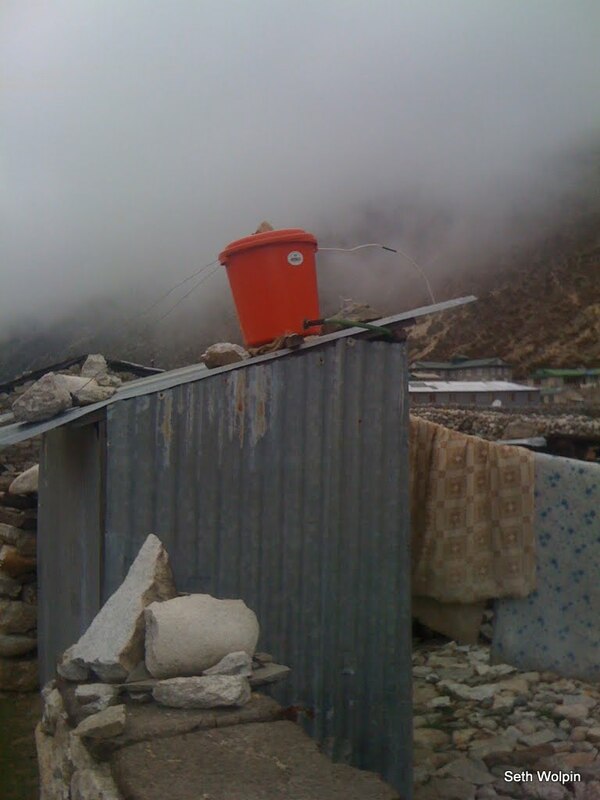 Namche should have been my first shower but I had a hard time staying awake. We cruised down to Phakding the next day and spent a night in Dorjee’s lodge (first shower in ~6 weeks!) before flying to Kathmandu from Lukla. We knew Oskar had arrived in Kathmandu that day and I finally called him. He was in the middle of downloading the program ‘Absolute Recovery’. About 30 minutes later he called back to ask if there was a picture of me ‘holding a flag with a W’ in it? Music to my ears! We watched small versions of the remaining pictures slowly download on my phone – inch by inch. I have to admit to being pretty depressed without the summit pics. The climb should be intrinsic – but it means a lot to share with others and, honestly, saying you climbed without pics to back you up is thin ice. So – please buy Oskar a beer for me if you ever get the chance to meet him. Or have him take a picture of your sail boat! Kathmandu has been a joy. And a big thanks to Dorjee and Dali for hosting us for dinner at their home last night. It was delicious and a perfect way to end a trip. All my bags are packed and I leave in a couple hours. Hoping to spend tomorrow afternoon kicking around Seoul with my friend Seungbum who I first met 16 years ago in Korea. Time flies. I’ve 80 odd pictures on picassa with summit shots too – https://picasaweb.google.com/wolpin hope you enjoyed the ones from these pages. Ciao! Whew, that shower must have felt good! 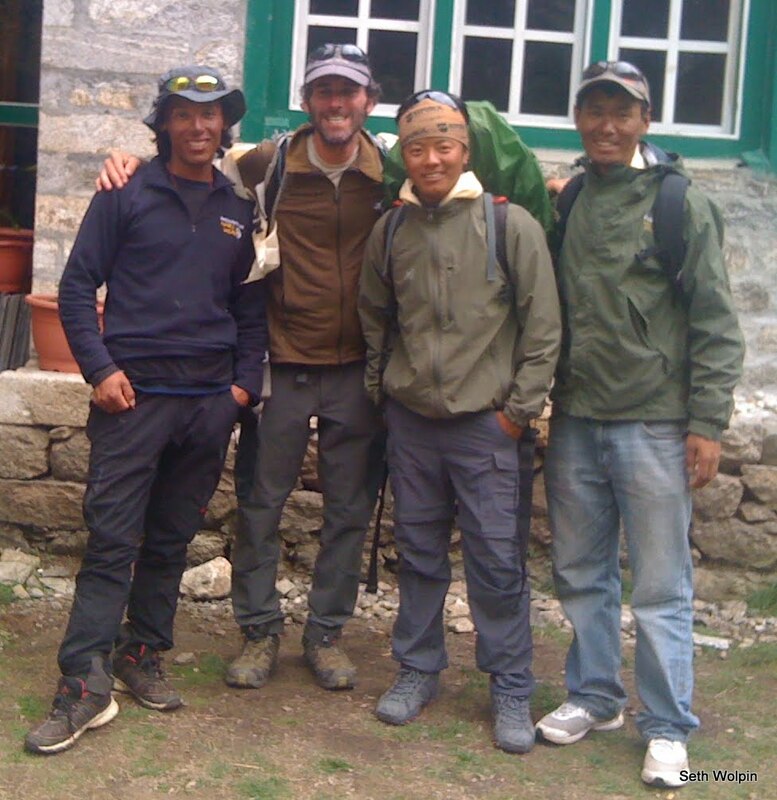 The pictures and diary have been great; thanks for the vicarious DIY Everest summit! Really enjoyed this post Seth. Pics too.